I’m much more likely to get out of bed if there is a dessert disguised as breakfast in it for me. It just makes waking up all the sweeter. My Breakfast Rice Pudding was my first foray. 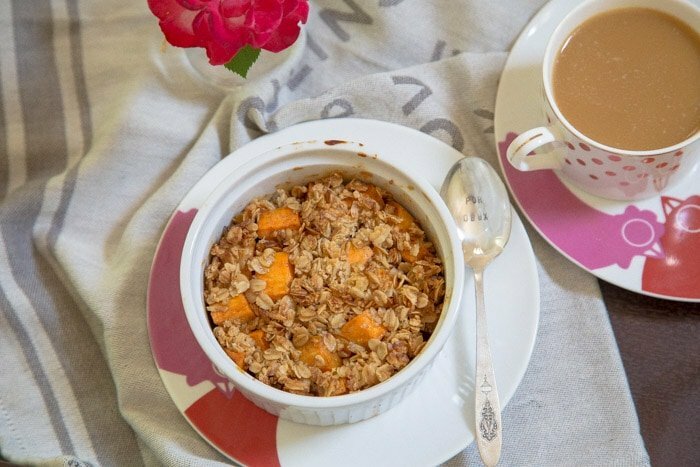 This sweet potato casserole turned healthy breakfast crisp is my next adventure. Right now, I’m working on the holiday desserts for my cookbook. It’s a bit like Thanksgiving in June in my house. I’ve got sweet potatoes for days in my pantry, hand cramps from crimping pie crusts, and the smell of toasted pecans permeates my hair. I was getting a lesson on how to apply false eye lashes the other day (oh god), and the guy asked me about my perfume that smelled of warm toasted nuts. We both agreed that if someone could bottle the smells of Thanksgiving we would wear it all year long. My Mom makes an amazing sweet potato casserole at Thanksgiving. It’s covered with toasted marshmallows, and it practically disappears in seconds. However, I’m trying to win at life so I won’t eat marshmallows at breakfast. 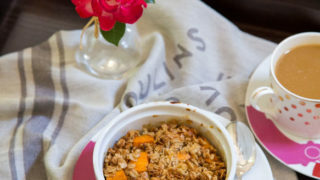 BUT, a sweet crispy oat topping is a nice, albeit healthier, substitute. The sweet potatoes swim in a sticky syrup made of agave nectar and spices. You could also use maple syrup or brown sugar. I also went light on the butter by substituting a bit of coconut oil. 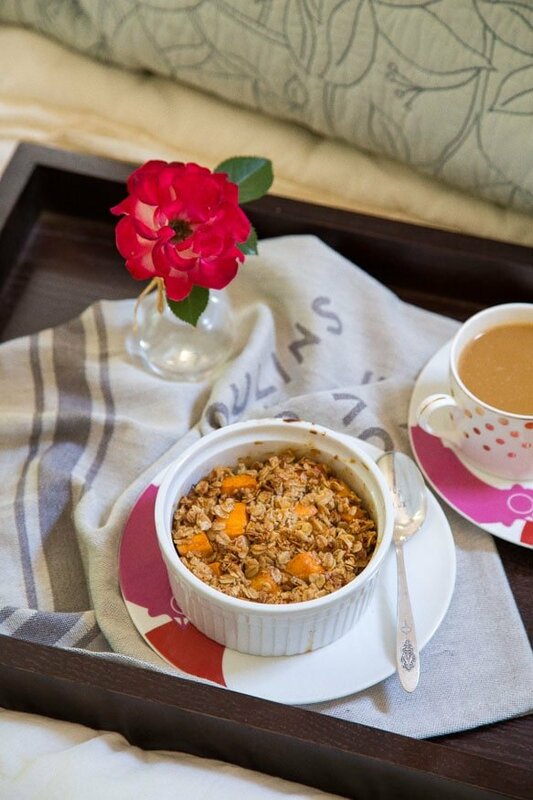 I like to eat this sweet potato breakfast cobbler in bed while lingering over my milky coffee and contemplating falling back asleep. But maybe don’t do this if you have an all white bed like I do? Just sayin’…someone in this house is still trying to get coffee stains out of the white comforter…moving on. 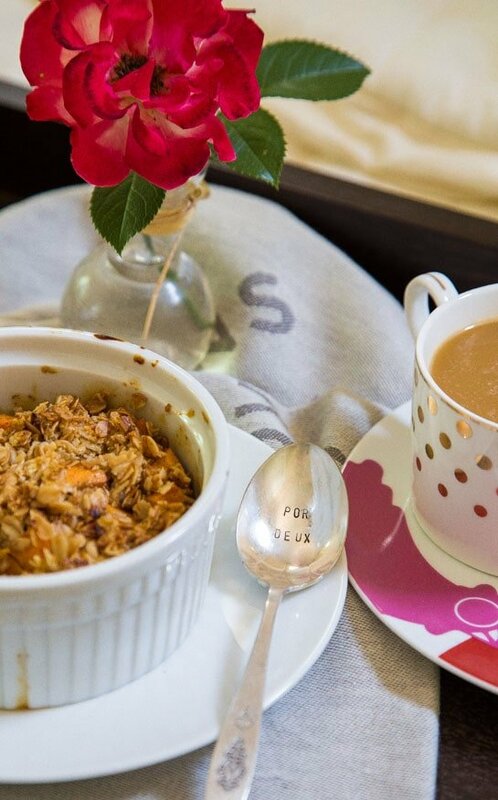 China check: hand-stamped spoons bearing dessert for two appropriate phrases by Ellie Rose Jewelry. Hot pink chicken plates by Marla Dawn Home. Gold polka dot coffee cup was a random score at Homegoods. I’m pretty obsessed with all of the above. In a medium bowl, combine the agave syrup, coconut oil, 1 tablespoon of the butter, cinnamon and ginger. Whisk to combine. Add the diced sweet potatoes and stir to combine. Divide the sweet potatoes in syrup between two 10-ounce ramekins. Next, in the same bowl, add the rolled oats and remaining tablespoon of butter. Work the butter through the oats until it's crumbly and well-coated. Crumble over the sweet potatoes. Bake at 375 for 20-30 minutes. Baking time depends on the size of the sweet potatoes. Test the pieces with a knife before removing them from the oven. Serve hot. OK. So you know that burger place we ate at when you were here? They’re building a Home Goods right next to it and I may just puddle. I know that’s perhaps frowned upon, but I don’t even care – life of a food blogger, right?! Sooooo excited for that holiday book! Such a fun way to spend the summer :) Annnnd this definitely looks like the perfect breakfast! I’d love to start my day with this sweet potato crisp – sounds delicious! I bet this is great, love a savory crisp! A new spin on breakfast to break up the boring, yes please. Sweet potatoes, bring them on. Love them. But I got all distracted with your coffee cup. You know, the white one with the gold dots. I am so loving that. It looks like Kate Spade to me? I wish someone would bring me breakfast in bed. I think you’re on to something with the Thanksgiving-scented perfume. Girl, you could be rich. Love this recipe. Pinned! Sweet potatoes for breakfast? I am totally sold! Ummm, dessert for breakfast? Yes, please. Also–that spoon! TOO cute. Love that I now have an excuse to eat sweet potatoes for breakfast! I’m pretty sure the definition of winning at life is eating marshmallows for breakfast. :) But this definitely sounds healthier (and extremely delicious). Breakfast cobbler FTW! I bow before you, my queen. Also, I steal your spoons. Can you send one over to Dallas so I can have this for breakfast?! Kthanksbye. I can’t wait for all of your holiday desserts recipes! Sweet potatoes for breakfast is perfect! That looks so pretty and cozy! AND delicious!! Thanksgiving in June needs to become a “thing”! Such a clever idea! I’m not sure why we pigeon hole certain foods (like sweet potatoes) into certain meals of the day (like dinner). It’s a silly practice that I’m glad to see you ditching. 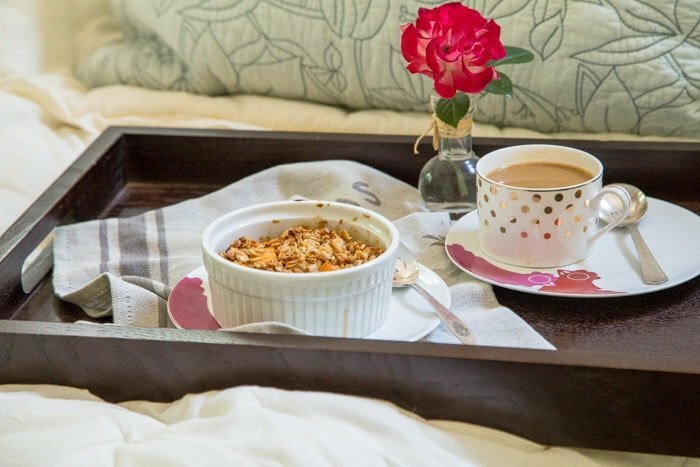 I’d like to wake up with that tray waiting for me. Looks so delicious, healthy, and filling! Just the fact that you used breakfast and cobbler in the same sentence is enough to convince me. I’m saving this one for a chilly fall morning. It sounds perfect! What a fun spin on sweet potatoes! Love the topping! I seriously love sweet potatoes year round, this looks like the perfect breakfast! A crisp for breakfast? Well then. I better get to making breakfast because this has become my new favorite thing ever. OMG. My favorite food for breakfast? Yes, please! Can’t wait to try this.